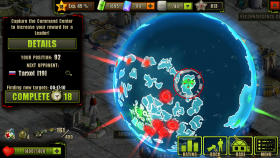 The battles for Command Center is one of the many features of the Player versus Player game mode in the Evolution: Battle for Utopia. 1. Among the archipelago bases there is always one base marked with crossed flags. It belongs to your enemy Leader and its capture will give you a special reward. 2. The reward amount will depend on your Position in the Command Center rating – the higher you are, the bigger is the reward. 4. The Command Center battles are fought between the players of one server with 700 and more Rating points. 5. In these battles you are to defeat the whole army of an enemy player, considering special Battle Rules that may limit some of your weapons. 6. If there is no opponent on a Position, you will fight a Wanderer – your own clone. Activates at 700 PvP points. These battles are for ladder position only. At some interval, each position on the ladder is paid in Gems with the top place receiving 100 Gems and the 100th place receiving 10 Gems. The battle is very similar to a standard battle. In that it is you and your chosen partner against your opponent’s entire team. No turrets are involved and the radar has no effect. Once your opponent has more than two partners, new ones will rotate in as in standard battles. Losing the battle neither affects your PvP points nor consumes resources. You must rest 20 minutes between battles if you win or if you lose. 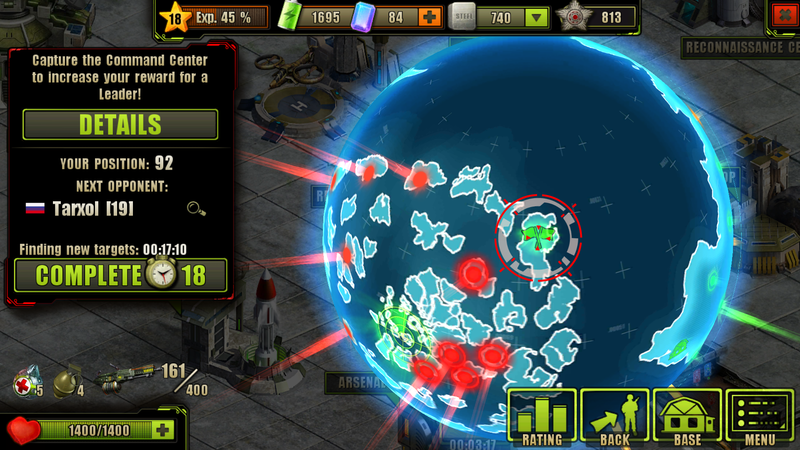 Performing a recon once unlocks the ability to view all opponents until the Archipelago resets. This means you can view multiple opponents if you win battles. no grenades: your grenades will not appear on the battle screen. Not clear if this also prevents shotgun grenades. no partner: you get no help from your partners. However, you will still fight all of your opponent’s partners. assault rifle only: you cannot use a machine gun or shotgun. Grenades and partners are available. Anyone knows at what interval is the reward issued? You can only get the gem award by attacking a player’s base where the gems are listed as the “spoils”. Yes it’s 20 mins I updated the description. I have noticed that my own clone uses the weapons that I have. If I have a fully upgraded Acid Shotgun, my clone uses that and it kinda works against me doesn’t it? No idea though, just my thought, that my clone gets stronger if I upgrade my weapon continuously. Never got any gems. Anything special you have to do to get the reward? I’m at position 61 now and my name is in the command center list. Didn’t get the reward for positions 71, 81 and 91 either. Cheers, Marc. If you prefer to finish off your enemies with a Psi Strike, think about buying the Visor bonus.